If you're a monotribe user, you should head over to the Korg website and download the WAV file system data update. This new system data will update your monotribe with a heap of new features including sync, sample & hold and extended sequencer functionality. As with drum parts, the synth part now provides timing information in between the steps in a sequence, allowing a pattern to achieve a total of 16 steps. Volume Automation allows the synth volume to be recorded during playback to create more detailed sequences. The Active Step function can specify which steps are played or jumped for each instrument when playing back the step sequencer. By specifying a different number of steps for each part, complex polyrhythms can be quickly created. In addition, a roll can now be added to any drum part. The speed of the roll can be controlled using the ribbon controller keyboard. 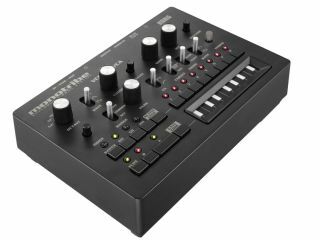 For creating those slightly random stepped-filter effects so famously used in analog synthesizers, a new Sample & Hold waveform has been added to the LFO. The Link Sequence feature is a completely new sync method for using multiple Monotribes. When sequence playback reaches the designated step, the first Monotribe automatically stops and the next Monotribe will start playing. By loop-connecting the SYNC jacks, the playback can keep cycling through multiple units - in true modular fashion. The Gate Time Hold function allows the ribbon controller keyboard to play and record new pitch information while retaining the gate times recorded in the sequencer. Also new is the Half Tempo function, which cuts the tempo in half when synchronizing to an external input from the SYNC IN jack. In addition, there are now four shortcut keys that instantly initialize various types of sequence data or active step settings.